“Thus we have the American grain elevators and factories, the magnificent FIRST-FRUITS of the new age.“ – Le Corbusier, Towards a New Architecture, 1927. A photograph of Carmel’s landmark historical grain elevator structure is one of the two anchor images of my project, Truth From Perceptions. 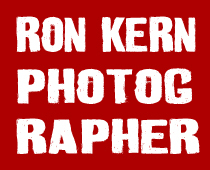 Currently it is in the 2 Photographers Works In Progress Exhibition at Midland Arts and Antiques Market in downtown Indianapolis. This is a portion of what I wrote about this area: It was a gorgeous winter day and it was like the sky was playing its own concerto. The interaction of the natural clouds with the contrails was quite something. 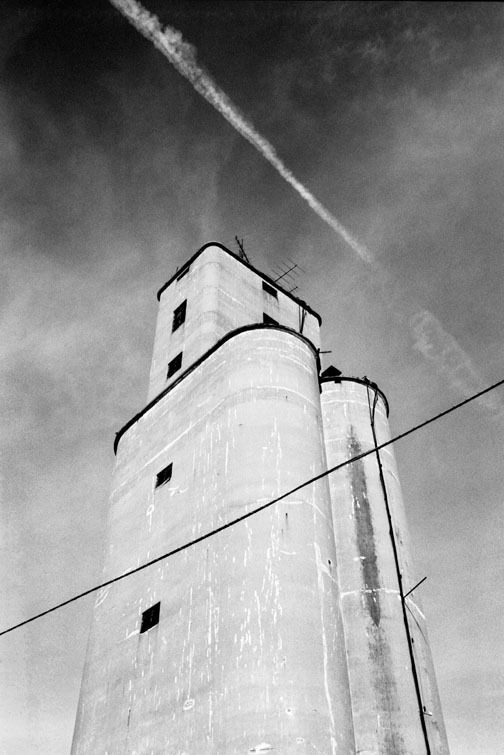 The area where these photographs were made is one that stills reveals Carmel’s history as a small town whose livelihood likely revolved around this grain elevator adjacent to the railroad tracks – maybe that is why I’m drawn here so often. From what I’ve been told from a very reliable source the CRC can do whatever it wants to in this area by virtue of zoning law. The CRC is an appointed government entity that does not answer to Carmel’s City Council and therefore the citizens of Carmel. And today I found out that they actually are able to encumber the City of Carmel with debt without getting approval from the City Council, ie the Citizens of Carmel. That was a shocker. Apparently the Mayor and the CRC have a plan to build an additional water tower straddling the Monon Trail that has fountains or some such thing and rather than consider integrating the grain elevator into the plan they are going to demolish it, again, with no public input. There are instances where these structures have been reused in various ways. Being a part of the Arts and Design District I would hope that rather than tear down one of the last historical structures connecting Carmel to its past that the CRC would come up with a more creative solution. Maybe even ask the public and artists and architects for some ideas. But recent history shows that Carmel’s government likes shiny new things. Problem is that, not much later, those shiny new things become dull older things that seemed like a good idea at the time. It was extremely disappointing to see in an Indianapolis Star article Carmel Clay Historical Society’s (CCHS) board member Fred Swift easily dismiss this structure as having no historical significance. Yet in the next breath he makes the case for the structure when he acknowledges that the structure has been a part of Carmel’s landscape for ninety years and was one of Carmel’s largest employers before Carmel was a “big suburb.” Update 2-25-2012 – From an IBJ article it is now known that the CCHS received a $31,000 grant from the 4CDC which is an organization that works as a shadow government entity that disperses Carmel public money with no public input nor oversight. So it is no surprise that the CCHS has no interest in preserving the grain elevator. I find it ironic that the CCHS is housed in, what I’m certain Mr. Swift considers historically significant structures, railroad depot buildings that were repurposed to suit CCHS’ needs and are in the shadow of the grain elevator. The Carmel Grain Elevator should be preserved as a historical landmark… Even as the town moves forward, and the landscape through the years has changed, it should always leave reminders of what once was. Also there is a discussion on Carmel City Councilor’s Rick Sharp’s Facebook page.